If you’ve been searching for a pour over coffee maker that gives beautiful aroma and amazing taste of freshly brewed coffee, then look no further. SEMKO have over 30 years of experience in designing and manufacturing high quality and simple things for table, kitchen and outdoor. We here at SEMKO take great pride in the time and quality we put into our products. SEMKO Pour Over Coffee Maker features a unique and innovative brewing design that provides the perfect brewing conditions. You don’t need to know what you’ re doing when using this coffee maker to get a good cup of coffee. Simply grind your coffee, pour it in and the well-designed portable coffee, maker handles the rest.NO NEED FOR PAPER FILTERS If you don’t want to deal with messy and wet used coffee filters, then our coffee maker is meant for you. It features a slow drip wire mesh (0.4mm) made from high quality and durable steel that will perfectly filter your coffee. 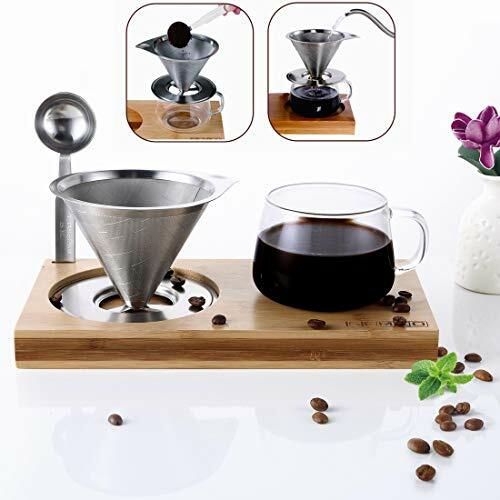 EASY TO CLEAN The wire mesh of pour over coffee maker is easy to clean and you reuse it within second simply by getting rid of the leftover grounds and rinsing the mesh so that you can brew a mess-free coffee every time. SAFE TO USE Our single serve coffee maker will brew once cup coffee with a great taste. It also stays cool to touch; thus, you don’t have to bother about getting burned. ECO-FRIENDLY Our high quality, well-built stainless steel single serve pour over coffee maker features durable and eco-friendly design. The BPA-free coffee maker is the perfect way to brew your coffee without worrying about any side effects. Offer Includes:.